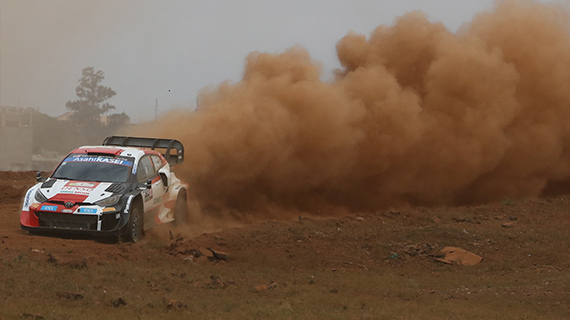 Team Tido’s Stig Blomqvist extended his KQ East Africa Safari Classic Rally lead over homeboy Carl “Flash” Tundo to 7 minutes during Friday's two stages in Tanzania. On a gloomy day which saw EASR Director killed on the road from Amboseli to Namanga, the top six position remained unchanged with multiple Kenya champion clinging to third ahead of British driver Richard Jackson. Kenyan Raaji Bharij came in fifth ahead of former Kenyan classic car champion Jonathan Somen. The 1984 World Rally Champion started the morning with a 4.19minutes advantage over Flash heading into the 100km Oldonyo Longido-Oldonyo Sambu section. “Two nice stages todays down there so that was good. A few mishaps that have affected everybody but we are all doing well,” said Stig. Stig topped the opening stage of the day, but Flash’s spirited fightback to close the gap came a cropper when the third stage was cancelled after the accident which left all and sundry heart broken. Flash punctured on the opening stage finishing eighth fastest but bounced back in awesome fashion to clinch the second stage. The rally will restart from Ol Tukai Lodge and head to a fast and smooth 70km Fence –Emali stage though a village and sandy river crossing. This stage opens up toward the end with new graded roads. This will be followed by two more stages at Tsavo and Maktau and into Taita Hills Lodge for the vernight stay.